AmazonBasics has a growing catalogue of lawn equipment. One of the products is a Havana Bronze Patio Heater, a free-standing outdoor heater that promises to have a 46,000 BTU’s heat output. Competitively priced, this commercial heater is a gas patio heater that is about 8 feet tall when put together. 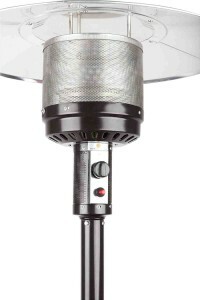 In this review, we help you analyze whether this outdoor heater is what you’re looking for. – It has a steel construction with a powder-coated bronze finish. – This is made in China. – It weighs 40 pounds. – It has an auto shut off tilt valve for guaranteed safety in case this heater gets tipped over. – Wheel assembly is included. Expect two wheels for easy mobility. – For stability, it has a base reservoir system. You can fill it with sand or water to make sure this outdoor heater has a steady base. In this section, we present our findings as regards the most important criteria that we know you’d like to find out about this commercial patio heater. – Heating Performance. In general, buyers say that this heater puts out enough heat. But the difference in their feedback is regarding the manufacturer’s claim that it can heat up to an 18-feet (diameter) area. While one says it does heat up to the promised diameter, others have not given a specific number. But then, it’s important to note that your unit’s actual heating range may depend on the following: whether the area is closed or not, whether it’s windy outside or not. – Assembly. The instructions and diagrams have been described as “well-written,” and the parts are well-labeled and have been pre-sorted. That said, it eliminates the need for you to match up the parts. As for assembly time, you may spend at least an hour to put things together. – Size. It has a small footprint, so it’s easy to store or “snug up near a table or seating area,” as one consumer has said. – Others. Some consumers complain about the protective plastic coating over the reflector, which can take time and effort to remove. Overall, while the AmazonBasics Havana Bronze Commercial Patio Heater has very minimal issues, it is nice-looking, sturdy, and effective in producing satisfactory heat.